We had our church service on 27th February with Pauline and Alison. There was a full house and the joyous singing of the hymns could be heard around the home. We have had several trips to the community café at Bisley Hall in February. These take place every Monday morning and a small group of residents and staff have enjoyed tea and cake with members of the local community. Sadly snow and rain have prevented us going every week although we are hoping that as the spring makes an appearance we can go every week as it makes a nice change. We have introduced Friday ‘Pamper afternoons’ and this has proved to be very successful. The foot spa is nice and relaxing and the face masks have been enjoyed by both female and male residents: we all need some TLC once in a while. We celebrated Shrove Tuesday with pancakes and discussed the origin of Shrove Tuesday. We had the choice of syrup, lemon and sugar, chocolate spread or honey as a filling and these were enjoyed by all! Valentine’s Day brought us happy- sad emotions talking about loved ones and our memories of those who are sadly no longer with us. All residents were given red roses and chocolates. We have new bingo balls and trays so we have been having regular games of bingo which can get very competitive. Bailey the PAT dog has been visiting every fortnight to see the residents. Many of our residents enjoying stroking him and he loves the attention. The next visit has been brought forward from 9th March to the 7th as a one-off. Pub lunches are still happening every fortnight and are as popular as ever. Fish and chips remains the most popular meal but some residents are sampling the other delicious dishes from the menu. Everyone makes us feel very welcome when we go to the Hen & Chickens and it is a very enjoyable outing which is highly anticipated by several of our residents. We have had some lovely art work done by our residents who have been painting and coloring in our adult coloring books. 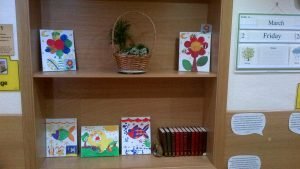 We have also had some canvas pictures which were painted in lovely bright paints and are proudly displayed in the resident’s bedrooms. we have been painting some stain glass effect windchimes too. Tina from High Kicks and Heels did her monthly performance for us on 27th February which was as enjoyable as ever. She really is popular with our residents and has people up dancing, waving flags and everyone sings along to her timeless classics. Other activities we have been doing include quizzes, chair- based exercises, cake decorating, reminiscing, floor skittles, bean bag game, manicures, DVD afternoons, question and answer cards, football and sing- along’s with instruments. March looks set to be a busy month with Easter at the end of the month. We will be having our usual Easter party and will be making Easter bonnets. We will also have other Easter themed activities. We also have the Easter Tea Dance at HG Wells to look forward to. This is always a popular event and is looked forward to, it is a shame the dances are every 3 months and not more often. Other things to look forward to is the arrival of our chick eggs. We had them last year where we have eggs which we keep warm in an incubator. Within a few days they hatch and we have our own fluffy baby chicks! This was hugely successful last year and we will be having them in the spring….. dates to be confirmed. There have been no changes to staff or residents during February. Iris Collier had visits from family members for her 96th birthday on 9th February. She received lots of cards, chocolates and flowers. She had a wonderful time at her afternoon tea party at Elmfield. We celebrated Roger Dodd’s birthday on Valentine’s Day. He had a lovely meal out with his family which he thoroughly enjoyed. This was thoroughly enjoyed. In the evening, we had our afternoon tea party celebration with his friends and staff at Elmfield. At our tea parties we have tiered sandwiches, nibbles such as pork pies, scotch eggs, quiche, sausage rolls, crisps and of course birthday cake! With banners, balloons and party hats! Niccii will be away on holiday from 13th– 28th March having a much- deserved break in the sun. We have registered with Carehome.co.UK which is one of the biggest databases of care homes nationwide. Enclosed with your monthly postal packs you will find some review cards. It would be much appreciated if you could complete those and send them back which is free postal so that we can have some feedback about the home. Review cards are returned directly to carehome.co.uk. where they will be added to our site, once verified. We are trying to get lots of feedback about the services we provide both internally and externally to identify what we do well and what we can improve upon. It is important that we are reviewing ourselves. Thank you to everyone who has completed a Quality Assurance Questionnaire; it is much appreciated.